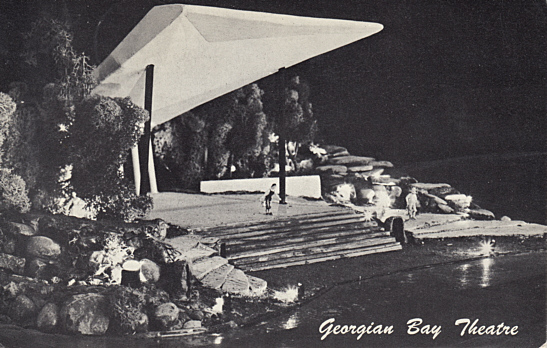 Front Text: "Georgian Bay Theatre"
Reverse Text: "Model of Georgian Bay Theatre. Drama, with unrivaled realism, ballet at its most beautiful, and the romance and pageantry of Canada's storybook history will come alive in the spectacular new Georgian Bay Theatre which opens with a four week season in July 1964. Situated in the heart of Ontario's vacationland at Parry Sound, Ontario, this new dimension of the theatrical arts is destined to become an international attraction."